My girlfriend and I spent 2 nights and 3 full days in Zermatt. It's great for skiing, but also great for unwinding. If you don't ski (like us), you can find time to clear your head and relax. It did come at the right time in our itinerary after the hustle and bustle of Paris. Zermatt is beautiful, relaxing, and everyone here is extremely friendly and helpful and getting by on English is a piece of cake. Switzerland has four national languages that includes French, German, Italian, and Romansh and in Zermatt, everyone speaks English as well. Zermatt offers something different in every season. Depending on your outdoor activity interest, you can visit Zermatt all year round. The snow starts to fall in November and ends around April. The best time to visit Zermatt for skiing is mid-July to September. From June to August is when the temperature starts to warm up during the day for hikes and walks. Still bring warm clothes as the nights are chilly. Zermatt is a small town and every hotel is pretty much walkable. There is a slight incline from the train station to the ski lift area, but for the most part, all of these hotels are in a good location. Also, everyone in Zermatt is extremely friendly and the hotel's staff are no different. Offers a shuttle to and from the train station and has an amazing view of the Matterhorn. It is in somewhat close proximity to a small cemetery, but there was minimal creepiness to it and we hardly noticed. Great service, location, and breakfast ranking #1 on Tripadvisor. Rooms are outstanding with a great location and friendly staff. Beautiful facility located in the middle of the town with a fantastic staff. Zermatt is car free and the only way to get there is by train. The two closest airports are Geneva and Zurich. I flew in from Paris to Geneva and took the RailEurope to VISP. At VISP, you'll change trains to the Matterhorn Gotthard Bahn for Zermatt. There is one every 30 minutes. The time it takes from Geneva to Zermatt ranges from 4-5 hours. If you still want to travel by car, you can park at Täsch, then take a shuttle or private service car into Zermatt. For more information, visit here. Zermatt is a reservation based town! Since this is a ski town, a lot of locals train in for the weekend and on a Friday and Saturday night, the restaurants are packed so you'll need to make a reservation. We went around to four or five different restaurants our first night and they all said they were booked for the night. We thought we were going to end up at the McDonald's ($9 for chicken nuggets by the way. Switzerland is very expensive, in case no one told you) but got lucky with one place called The Factory, that let us grab drinks at the bar while we waited for a table to open up. Some of the restaurants are only open for dinner, like my one favorite called The Bubble. My girlfriend and I asked our hotel to make same day reservations. We highly recommend the Cajun burger and the pineapple burger. We realize $26 is a bit steep for a burger but this was pretty well worth the price and maybe even on the reasonable side compared to some other places. If it helps, you don't have to tip here, similar to all other places in Europe. The Bubble (Western) - Great burgers and fries! The Factory (Italian) - Good location and friendly staff. Food isn't the best Italian food, but wasn't bad. Restaurant Chez Vrony - Great food with a fantastic view of the Matterhorn. Findlerhof - Great mountain restaurant with delicious food! Walliserstube Zermatt - Traditional food with a passionate chef. McDonald's (Western) - For when there are no reservations available. They have some unique items on the menus like the McFlurry Toblerone! This is a must go. Although the price is steep ($80) you should not skip this. It has one of the best views of the Matterhorn. Not to mention the scenic train ride up. Who wouldn't want to ski on the Matterhorn! Slopes ranges for all levels. Paragliding next to the Matterhorn..how could you not! These hiking trails lead you to even better views of the Matterhorn. 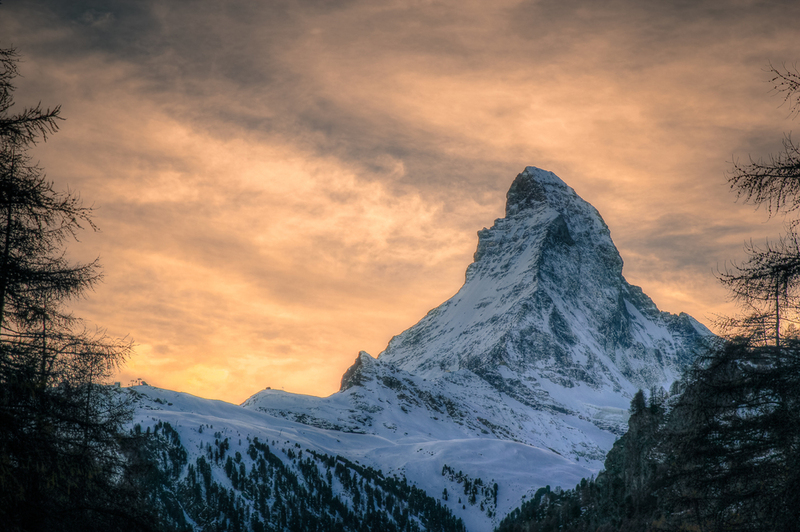 Learn about the history of Zermatt and the iconic mountain. Zermatt's Official Tourism Board has already gathered the best photo points with a map listing where they are. GORNERGRAT BAHN - Unique vantage point of the mountain while on the train and on top. HOTEL LA COURONNE - Right in front of the hotel is a perfect view of the Matterhorn.